I hope everyone had a great weekend! Saturday, we traveled to a nearby town for a hot air balloon festival. It was a race, so we got to watch 25 hot air balloons launch within 45 minutes. It was an amazing sight to see! First of all - why do publishers feel the need to change covers between U.K. and U.S. editions of a book? And even more confusingly, for the book I recently read, they also changed the title! Surely those are two completely different books, right? Nope! The cover on the right is the U.S. version, which means that it's the version that my library had, of course. The premise of the book is that a London police officer discovers that magic is real and is "drafted" into the branch of the police force that deals with ghosts, vampires, werewolves, etc. Not normally my kind of book, but I had heard it described as "grown-up Harry Potter" and wonderfully British, so I thought I would give it a try. I enjoyed it, but I couldn't read it at night before I went to bed. In fact, I ended up piling other books on top of it on my nightstand because of the cover. The (spoiler!) revengeful ghost aspect of the story was really freaking me out, and I think I can partially trace that to the cover. The U.S. cover just looks scarier than the U.K. cover. To a certain extent, it affected my reading (and enjoyment) of the book. Has this ever happened to anyone else? Has a cover changed the way you viewed a book, either positively or negatively? It's official - my little guy is walking! He's been walking while holding on to something really well for a month now, but he finally gained the courage this week to let go and try it on his own. He's still pretty wobbly, but I love seeing how proud of himself he is when he tries. I have a feeling that all too soon, I'll regret wanting to rush him to this point because I won't be able to keep up with him anymore! I've rediscovered the wonder of audiobooks for getting a lot of reading done during the week. I used to listen to a lot of audiobooks while I nursed my little guy - but that doesn't happen so much anymore. And then I discovered podcasts, so I've been listening to a lot of those. But I participated in Bout of Books last week, and I knew I wanted to up my reading time with an audiobook. I made it through two and a half, and beat any previous Bout of Books record I had all to pieces. Audiobooks for the win! Okay, I just couldn't resist. I wasn't planning to do Bout of Books this time around, because I just don't have extra time in my life right now to devote to reading. I'm happy if I get through thirty pages a day. But then I decided that Bout of Books is low pressure, and I don't have to read any extra to participate. It's just fun to be part of the community reading together. So here I am, signing up! Henry York arrives in the town of Henry, Kansas, to live with his aunt, uncle, and three cousins after his parents have disappeared. His bedroom is the attic, and one night, two knobs from a cupboard poke through the plaster. After chipping away at the plaster, Henry discovers that the whole wall is filled with cupboards, and each leads to a different place. Some of them are safe, and some of them are not. And all of them hold secrets about Henry and his family. I was completely pulled into this book from page one by the writing. N.D. Wilson has a style that's just full of perfectly worded phrases that create such an image in your brain (what I like to call "shiver language"). I can't resist sharing two examples - "In the same summer, a bottle rocket brought the gift of fire to the bus station's restrooms." and "He was used to milk with transparent edges, milk that looked a little blue. This milk looked more like cream. . . In his mouth, he could feel it clinging to his tongue. His tongue didn't mind." The writing brings both Henry the boy and Henry the town to life and sends them on breath-taking adventures. 100 Cupboards is the first book in a trilogy, and I am impatiently waiting to get back to the library to read the rest of the series. This is definitely a book that I will be buying and sharing with my little boy when he's old enough. I first heard about this book on the Read Aloud Revival podcast (both episodes 44 and a bonus episode called "Some of the Best Books by Living Authors"). Alice Whitley is assigned to help literary recluse M.M. Banning produce her first book in many years. It turns out that "helping" her mostly entails taking care of her nine-year-old son Frank, who dresses like someone out of a 1930s film and marches to his own drum. Frank is the best character I have met in a long time. Unique doesn't begin to describe him. Frank is the heart and soul of this book. While some of Alice's decisions drove me crazy, I was never disappointed in any scene in which Frank appeared. When I read the last page, I was so sad that I was done spending time with Frank. He's one of those characters who you feel is surely continuing to live their life, even though the book is over, and I only wish I could be part of that life. Penelope Lumley arrives at Ashton Place, determined to be the best governess she can be for her three new charges - only to discover that they are locked in the barn and can only howl instead of talk. They were raised by wolves in the woods surrounding Ashton Place, and Penelope suddenly has a rather different job than she expected. Penelope Lumley has one of those voices that you just savor as you read a book. She is down-to-earth yet optimistic, determined to do her best even though she really doesn't have any idea how to go about doing that. The children are delightful, and the whole premise of the book is so well executed. This is the first book in a six-book series called The Incorrigible Children of Ashton Place, and I can guarantee that these are books I will be collecting and rereading. 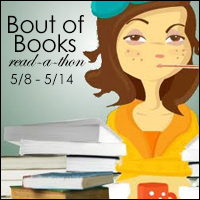 Dewey's 24 Hour Readathon was on Saturday! Did you participate? I had a great time! My husband did his best to give me the day off from taking care of my little guy, which mostly worked (he was a little clingy - working on those one-year-old molars). It was so wonderful to be able to sit and read without having to feel guilty about the myriad of things that weren't getting done. Can we do it again next weekend? When Do You Decide What Rating to Give a Book?